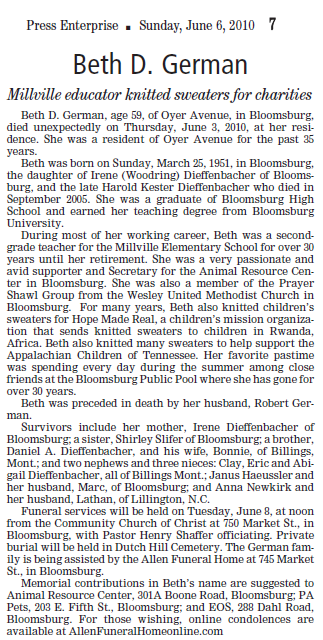 Beth D. German, age 59, of Oyer Avenue, in Bloomsburg, died unexpectedly on Thursday, June 3, 2010, at her residence. She was a resident of Oyer Avenue for the past 35 years. She was a graduate of Bloomsburg High School and earned her teaching degree from Bloomsburg University. During most of her working career, Beth was a second grade teacher for the Millville Elementary School for over 30 years until her retirement. She was a very passionate and avid supporter and Secretary for the Animal Resource Center in Bloomsburg. She was also a member of the Prayer Shawl Group from the Wesley United Methodist Church in Bloomsburg. For many years, Beth also knitted children’s sweaters for Hope Made Real, a children’s mission organization that sends knitted sweaters to children in Rwanda, Africa. Beth also knitted many sweaters to help support the Appalachian Children of Tennessee. Her favorite pastime was spending every day during the summer among close friends at the Bloomsburg Public Pool where she has gone for over 30 years. Funeral services will be held on Tuesday, June 8, at noon from the Community Church of Christ at 750 Market St., in Bloomsburg, with Pastor Henry Shaffer officiating. Private burial will be held in Dutch Hill Cemetery. The German family is being assisted by the Allen Funeral Home at 745 Market St., in Bloomsburg. EOS, 288 Dahl Road, Bloomsburg. Thank you for all the hard work you did for ARC, Beth. wow, i just found out about her passing. . . she was one of my favorite teachers! very sad. . . I miss you Beth, you were my feline soul sister. I will always love you!! !